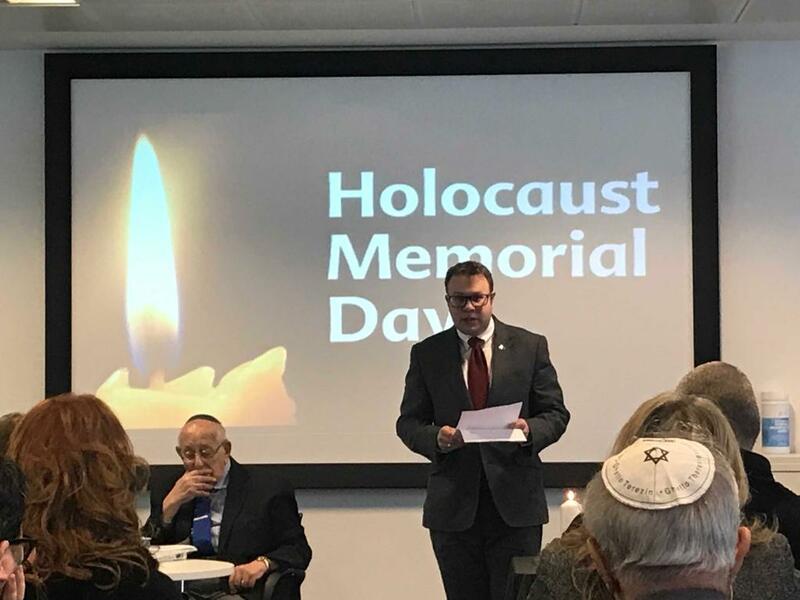 Manchester – WJC Jewish Diplomat Daniel Berke (UK) spoke on behalf of the WJC yesterday, on the International Holocaust Remembrance Day, to Greater Manchester Police Officers about the horrors of the Holocaust and the importance of the WJC’s #WeRemember campaign. WJC Jewish Diplomat Daniel Berke (UK) shared the memory of a young Jewish boy from Moravia, Tomas Kulka, who was murdered in Sobibor aged 7. Speaking at the event were Holocaust survivors Ruth and Werner Lachs. 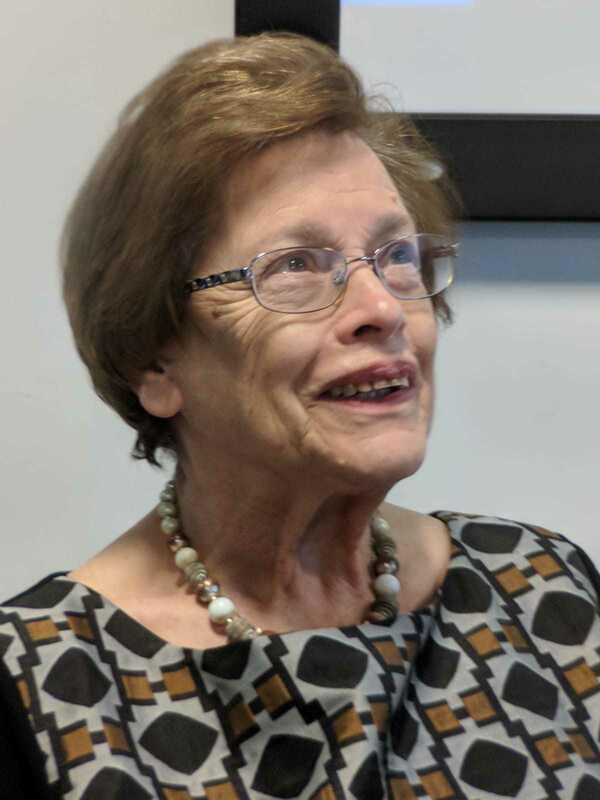 Ruth was a young girl in Holland during the Holocaust. She was aided by the Underground but was betrayed. She managed to survive in hiding, though her younger brother Karl was murdered, aged 3. Werner witnessed Kristallnacht and his life was saved by the MI6 agent and Righteous Gentile Frank Foley. In attendance were civic officials, Rabbi Daniel Walker and Deputy Chief Constable Ian Pilling. Werner Lachs recited Kaddish and six police officers lit 6 candles for those whose lives were cut short through hatred. Yet, humanity is forgetting and is forgetting whilst the Holocaust remains just within living memory. In a deeply disturbing CNN poll released just weeks ago, it was reported that more than one-third of Europeans know very little or nothing about the Holocaust. About the almost total destruction of European Jewry and other so-called ‘undesirables’. With the last remaining survivors dwindling, it has now become our common responsibility, and the responsibility of the next generations to keep their stories and memories alive. The scale of the slaughter of European Jews was so vast, so industrial, that it is impossible to comprehend. Six million. 3,000,000 in Poland, 228,000 representing 90% of Jews in the Baltic Countries, 450,000 in Hungary where 7 out of 10 Jews were killed. Behind each number there is a human being like you, like me, like your grandchildren, like your grandfather who read you stories when you were sick. Each unit in that unfathomable figure, was a life destroyed. We owe it to them and to the future of humanity to remember. To remember that they once lived and had lives, dreams and hopes, families, communities and that they were all destroyed; their villages erased, their synagogues burnt, their hopes annihilated, beaten, shot in pits, starved, worked to death, herded into cattle trucks, husbands ripped from wives, children from mothers, gassed. Do not let them fade into the annals of history. So I want to ask you to do something. I want you to remember a name. One name. To commit it to your memories. Tomas Kulka was a Jewish boy who lived in Moravia, present-day Czech Republic. In 1939, when he was 5 years old, the Nazis occupied Moravia. Because Tomas was Jewish, he was not allowed to attend school. On March 31, 1942 Tomas and his family were sent to the transit camp of Theresienstadt. That same year his parents died in the Ossova labor camp in Ukraine. 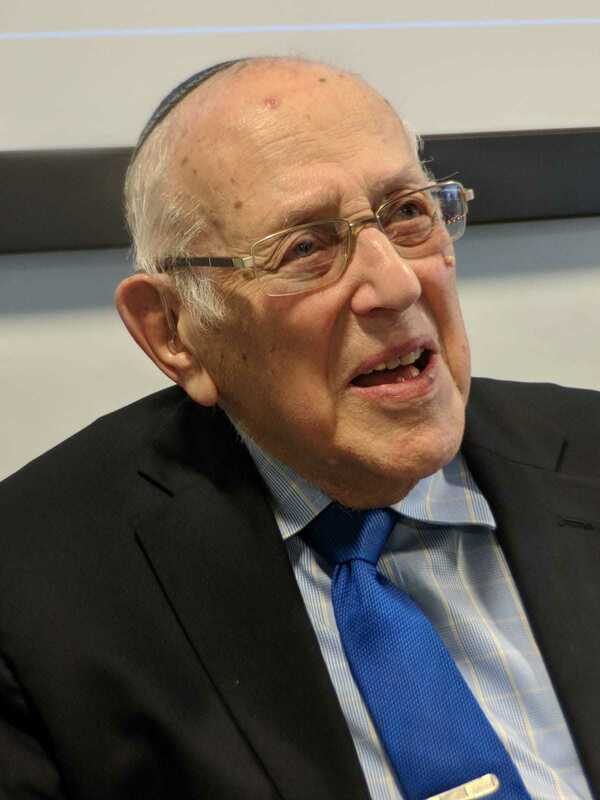 In May, he and his maternal grandmother were deported to Sobibor, where they were gassed upon arrival. I only pray that his grandmother managed to stay with him to the end. Tomas was two weeks short of his eighth birthday. Tomas Kulka - please remember him today and guard his memory for generations to come. I am speaking to you today as a member of the Jewish Diplomatic Corps of the World Jewish Congress, the international organisation that represents Jewish communities and organizations in 100 countries around the world. It advocates on their behalf towards governments, parliaments, international organizations and other faiths. The WJC represents the plurality of the Jewish people, and is politically non-partisan. I want to ask you to do something else – and I want you to do it today, on the anniversary of the liberation of the Auschwitz-Birkenau Nazi death camp. I want you to join the third annual WJC #WeRemember campaign. The campaign started on the 6th of January and ends today. I want you to join this campaign and to encourage your friends, families and colleagues to do the same. The #WeRemember initiative urges people around the world to photograph themselves holding a #WeRemember sign and post it to social media using the hashtag #WeRemember, to spread the message that never again must mean never again. Last year, the campaign reached more than 650 million people – more than one out of 11 people worldwide. It has run with a number of partners including several social media giants and major sports clubs, and has been supported by numerous world leaders including Pope Francis and UN Secretary General António Guterres. The United Nations Educational, Scientific, and Cultural Organization has also joined the WJC as an integral partner, after launching together a joint website on Holocaust education - aboutholocaust.org. It is a simple gesture, but it is a powerful commitment to preserve the memory of those who perished, it is a promise that we will not tolerate hatred, it is an assurance that we will educate generations to come and never forget. That is why Holocaust Memorial Day and this campaign are so important. We must not stop speaking about the Holocaust. We must not forget the sheer horror and the lives lost. The Holocaust did not start with gas chambers, it started with words. Words are that powerful. We want to use these two simple words We Remember, for good, for right, and to combat words of hate and to stop evil from repeating itself. The Jewish Diplomatic Corps of the World Jewish Congress (WJC JDCorps) is the diplomatic flagship program of the WJC, and a worldwide network of 300 Jewish professionals from 50 countries acting in the fields of diplomacy and public policy on behalf of world Jewry. Read more: http://jdcorps.org.